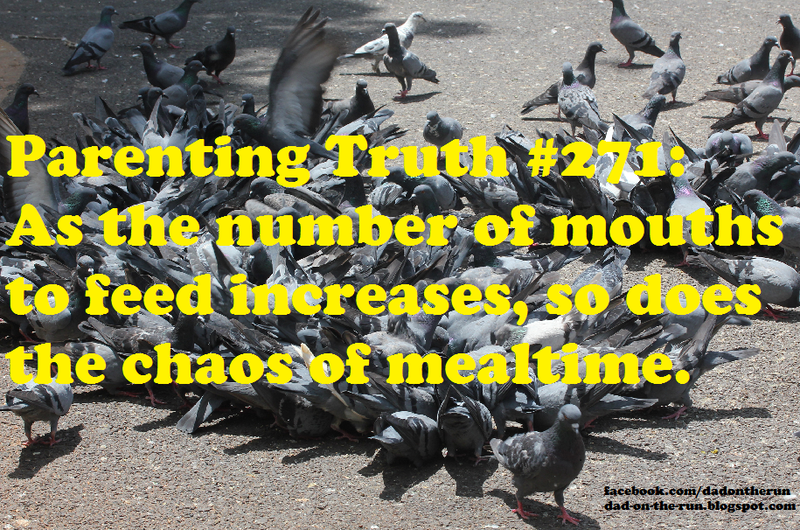 Parenting Truth #271: As the number of mouths to feed increases, so does the chaos of mealtime. One Baby - Gourmet home cooking or take out for the parents. The baby is fed face to face, strapped in with a bib on and eating organic/homemade fresh produce puree. 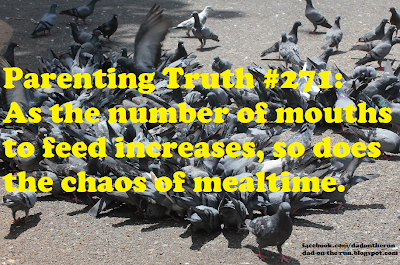 Two children - Make a healthy meal for the older one and the parents, whatever baby food was on sale for the little one can be fed to him/her in the highchair while you buzz around the kitchen. Three children - Cheesy Mac, chicken nuggets, fruit and a vegetable for the older kids. Mom and Dad get to pick through the leftovers. Baby eats banana and whatever else you think he/she will like and not spew on the floor while you are trying to prepare the other meals. He's not strapped in, just hanging on to your pants leg making movement next to impossible. Four children - Parents drinking their lunches. Elder child enlisted to make PB&J's for the middle kids. Baby amazingly gets fed in highchair again while Mom or Dad line up shooters. Five children - Throw a loaf of bread and a pack of bologna in the room with all the walkers. Mom or Dad shares baby food with the youngest and wonders if he/she should take another Xanax. Six Children - The children seem to fend for themselves for the most part, hard to tell because you've lost count. Parent and children who are smart enough to shadow him/her get some frozen pizza or ice cream. Seven children - Porridge maybe? I don't know what they do. I'm assuming there is some sort of meals on wheels program for these poor souls. Eight or more Children - Meals catered on the set of your own reality show. Take away... all or nothing. Stop at one or push through to 8. Otherwise, your diet and sanity will suffer. Five children had me falling out of my chair. The "walkers" bit still has me laughing right out loud. Great post brother. I'll be back. Thanks for stopping by! How did you come across the post if you don't mind me asking? I joined the Dad Bloggers group on FB and saw the link to the post. The rest is history. Recent history, but history nonetheless.